Not to be confused with Carlos Valenzuela. For the Spanish marquis and grandee, see Fernando de Valenzuela, 1st Marquis of Villasierra. This name uses Spanish naming customs: the first or paternal family name is Valenzuela and the second or maternal family name is Anguamea. Fernando Valenzuela Anguamea (Spanish pronunciation: [feɾˈnando βalenˈswela]; born November 1, 1960) is a Mexican former professional baseball pitcher. Valenzuela played seventeen Major League Baseball (MLB) seasons, from 1980 to 1991 and 1993 to 1997. While he played for six MLB teams, he is best remembered for his time with the Los Angeles Dodgers. Valenzuela batted and threw left-handed. His career highlights include a win-loss record of 173–153, with an earned run average (ERA) of 3.54. Valenzuela was notable for his unorthodox windup and for being one of a small number of pitchers who threw a screwball regularly. Never a particularly hard thrower, the Dodgers felt he needed another pitch; he was taught the screwball in 1979 by teammate Bobby Castillo. Valenzuela was signed by the Dodgers on July 6, 1979 and debuted late in the 1980 season. In 1981, in what came to be called "Fernandomania", Valenzuela rose from relative obscurity to achieve superstardom. He won his first eight starts (five of them shutouts). Valenzuela finished with a record of 13-7 and had a 2.48 ERA; the season was shortened by a player’s strike. He became the first, and to date, the only player to win both Cy Young and rookie of the year awards in the same season. Valenzuela had the best period of his career from 1981 to 1986. He was named a National League (NL) All-Star in each season and won a major league-leading 21 games in 1986, although Mike Scott of the Houston Astros narrowly beat him out in the Cy Young Award voting. Valenzuela was also known as one of the better hitting pitchers of his era. He had ten career home runs and was occasionally used by Los Angeles Dodgers manager Tommy Lasorda as a pinch-hitter. However, for the remainder of Valenzuela’s Dodgers career, his pitching efforts were rendered less effective, largely due to nagging shoulder problems. He was on the Dodgers’ 1988 World Series championship team, but he did not play in the postseason due to his ailing shoulder. On June 29, 1990, Valenzuela threw his only MLB no-hitter, pitching at Dodger Stadium against the St. Louis Cardinals, a 6-0 victory. The no-hitter was notable for being the second one pitched that day, as former-Dodger right-hander Dave “Smoke” Stewart of the Oakland Athletics had just no-hit the Toronto Blue Jays, a few hours earlier. Despite having recently shown flashes of his former self, he was unceremoniously released by the Dodgers, just prior to the 1991 season. The remainder of his big league career was spent with the California Angels, Baltimore Orioles, Philadelphia Phillies, San Diego Padres, and St. Louis Cardinals. Valenzuela retired from baseball after the 1997 season. In 2003, he returned to the Dodgers as a broadcaster. In 2015, he became a naturalized American citizen. Fernando Valenzuela, the youngest of twelve children, was born in Etchohuaquila, a small town within the municipality of Navojoa in the state of Sonora, Mexico. His birth date is officially listed as November 1, 1960, but during his rookie season in 1981, several commentators questioned his age, guessing him to be significantly older than twenty. In 1977, Valenzuela began his professional baseball career when he signed with the Mayos de Navojoa. A year later, he was sent to the Guanajuato Tuzos of the Mexican Central League, posting a 5–6 record with a 2.23 ERA. The following year, the Mexican Central League was absorbed into the expanded Liga Mexicana de Beisbol (Mexican Baseball League), automatically elevating then 18-year-old Valenzuela to the Triple-A level. Pitching for the Leones de Yucatán (Yucatán Lions) that year, Valenzuela went 10–12 with a 2.49 ERA and 141 strikeouts. A number of MLB teams scouted Valenzuela during this time. Los Angeles Dodgers scout Mike Brito had gone to a game in Mexico to evaluate a shortstop named Ali Uscanga. Valenzuela threw three balls to Uscanga to fall behind in the count, then threw three straight strikes to strike out the batter. Brito said later that at that point, he "forgot all about the shortstop". The Dodgers finally gambled on the young lefty, buying out his Liga contract on July 6, 1979, for $120,000. After acquiring Valenzuela in the summer of 1979, the Dodgers assigned him to the Lodi Dodgers of the High-A level California League, where he posted a 1–2 record and a 1.13 earned run average (ERA) in limited action. The Dodgers felt that Valenzuela needed to learn to throw an off-speed pitch, so they had Dodgers pitcher Bobby Castillo teach him to throw the screwball before the 1980 season. In 1980 Valenzuela was promoted to the Double-A level San Antonio Dodgers. There Valenzuela led the Texas League with 162 strikeouts, finishing the season with a 13-9 win-loss record and a 3.10 ERA. Valenzuela was called up to the Los Angeles Dodgers bullpen in September 1980. In the last month of the season, Valenzuela helped the Dodgers to a tie with the Houston Astros for the Western Division lead, pitching 17​2⁄3 scoreless innings of relief over the course of ten games, during which he earned two wins and a save. However, the Dodgers then lost a one-game playoff – and thus the division championship – to the Astros. The following season, Valenzuela was named the Opening Day starter as a rookie after Jerry Reuss was injured 24 hours before his scheduled start and Burt Hooton was not ready to fill in. Valenzuela shut out the Houston Astros 2–0. He started the season 8–0 with five shutouts and an ERA of 0.50. In addition to his dominance on the mound, Valenzuela's unusual and flamboyant pitching motion – including a glance skyward at the apex of each wind-up – drew attention of its own. It was a habit which he claims to have developed spontaneously, although not until joining the Dodgers. An instant media icon, Valenzuela drew large crowds from Los Angeles' Latino community every time he pitched and triggered high demand across the country for his rookie baseball card. The craze surrounding Valenzuela came to be known as "Fernandomania." During his warmup routine at Dodger Stadium, the PA system would play ABBA's 1976 hit song Fernando. He became the first player to win the Rookie of the Year Award and the Cy Young Award in the same season. He was also the first rookie to lead the National League in strikeouts. The Dodgers won the World Series that season. Valenzuela was less dominant after the 1981 player strike wiped out the middle third of the season, but the left-hander still finished with a 13–7 record and a 2.48 ERA. He led all pitchers in complete games (11), shutouts (8), innings pitched (192.1) and strikeouts (180). In the postseason, Valenzuela became the youngest pitcher to start the first game of a World Series and pitched a complete game in Game 3 against the New York Yankees. In total, he went 3–1 in the postseason as he helped the Dodgers to their first world championship since 1965. In addition to his skills on the mound, Valenzuela also displayed much better offensive skills than most pitchers. During his rookie season, Valenzuela batted .250 and struck out just nine times in 64 at bats, and was the recipient of the National League's Silver Slugger Award for pitchers. Following his outstanding debut, Valenzuela, nicknamed "El Toro" (the Bull) by fans, settled down into a number of years as a workhorse starter and one of the league's best pitchers. He had one of his best seasons in 1986, when he finished 21–11 with a 3.14 ERA and led the league in wins, complete games and innings pitched. He lost a narrow vote for the Cy Young Award to the Astros' Mike Scott. At the 1986 All-Star Game, Valenzuela made history by striking out five consecutive American League batters, tying a record set by fellow left-handed screwballer Carl Hubbell in the 1934 contest. In 1987 his performance declined; he earned a 14–14 win-loss record with a 3.98 ERA. In 1988, a year in which the Dodgers won the World Series, he won just five games and missed much of the season. He improved slightly in 1989 and went 10–13, and went 13–13 in 1990. He had one last great moment on June 29, 1990, when he threw a 6–0 no-hitter against the St. Louis Cardinals just hours after the Oakland Athletics' Dave Stewart had thrown one against the Toronto Blue Jays. According to teammate Mike Scioscia, Fernando and many Dodger players watched Stewart, who was a former Dodger, throw the no-hitter on TV. Afterward, before his game, Fernando said to his teammates, "You just saw a no-hitter on TV, now you will see one in person." Early in his major league career, Valenzuela had trouble communicating with his catchers because he spoke very little English. Mike Scioscia, after being called up as a rookie, made the effort to learn Spanish and eventually became Valenzuela's "personal catcher" with the Dodgers before becoming the full-time catcher. After pitching ineffectively in spring training in 1991, Valenzuela was released by the Dodgers. At the time of Valenzuela's release, several Dodgers leaders, including Tommy Lasorda, Fred Claire and Peter O'Malley, praised Valenzuela for creating exciting memories over several seasons and they indicated that it was a difficult decision to release him. An abortive attempt at a comeback with the California Angels failed later that summer. Valenzuela signed with the Detroit Tigers in the spring of 1992, but he never played for the team, and his contract was purchased by Jalisco of the Mexican League that summer. He pitched and played some first base when he wasn't on the mound before making another brief comeback in 1993 with the Baltimore Orioles. Jumping between the big leagues and Mexico for the next few seasons, he put together one more solid big-league season in 1996 for the San Diego Padres, going 13–8 with a 3.62 ERA. He retired a year later with a final record of 173–153 and a 3.54 ERA as a member of the St. Louis Cardinals. The Los Angeles Dodgers invited him to spring training in 1999, but he declined the offer. On June 29, 2004, Valenzuela announced he would return to the mound in the Liga Mexicana del Pacífico (the Mexican Pacific Coast League) to play for Los Aguilas de Mexicali in October, at which time he was nearly 44 years old. He pitched again in the Mexican winter league during the 2005–06 season. On December 20, 2006 in Mexicali, BC, Mexico, Fernando Valenzuela was the starting pitcher for Los Aguilas de Mexicali in the last professional game of his career. Valenzuela was considered an atypically good hitter for a pitcher. His best year at the plate was 1990, his last year with the Dodgers, when he hit .304 with five doubles, one home run, and 11 RBI in 69 at-bats. That gave him a 101 OPS+, meaning Valenzuela ranked just above average among all National League hitters that year, including non-pitchers. In 936 career at-bats — roughly two full seasons worth of at-bats for a full-time position player — his career batting average was .200, with 10 home runs, 26 doubles, and 84 RBI. Valenzuela was even used on occasion as a pinch-hitter, batting .368 (7-for-19) in such situations. Twice while with the Dodgers, Valenzuela was called upon to play outfield and first base in marathon extra-inning games in which he did not pitch. He won the Silver Slugger award for pitchers in 1981 and 1983. In 2003, Valenzuela returned to the Dodgers organization as the Spanish-language radio color commentator for National League West games, joining Jaime Jarrín and Pepe Ýñiguez in the Spanish-language booth. In 2015, he was switched to the color commentator job on the Spanish-language feed of SportsNet LA. Valenzuela also served on the coaching staff of Team Mexico during the 2006 World Baseball Classic, 2009 World Baseball Classic, 2013 World Baseball Classic and 2017 World Baseball Classic. He purchased the Mexican League team Tigres de Quintana Roo in 2017. Valenzuela was inducted into the Hispanic Heritage Baseball Museum Hall of Fame on August 23, 2003, in a pregame on the field ceremony at Dodger Stadium. In 2005, he was named one of three starting pitchers on MLB's Latino Legends Team. In 2013, he was enshrined into the Caribbean Baseball Hall of Fame. Dodgers clubhouse manager Mitch Poole has unofficially kept Valenzuela's jersey number 34 out of circulation out of respect for him. On October 26, 2010, ESPN broadcast a documentary commemorating Valenzuela's arrival with the Dodgers titled Fernando Nation as part of their 30 for 30 documentary series. On October 25, 2017, Valenzuela threw the first pitch at game 2 of the 2017 World Series at Dodger Stadium, introduced by Vin Scully and joined by Steve Yeager. In 1981, Valenzuela married Linda Burgos, a schoolteacher from Mexico. Early in his career, Valenzuela and his family spent offseasons between the Mexican cities of Etchohuaquila and Mérida. The couple have four children. One of Valenzuela's sons, Fernando, Jr., played in the San Diego Padres and Chicago White Sox organizations as a first baseman. Since 2006, he[who?] has played minor league baseball in Mexico or in independent leagues. Valenzuela became a U.S. citizen on July 22, 2015 at a ceremony in downtown Los Angeles. He has participated in two Tournament of Roses Parades, in 1983 aboard the float from the Government of Mexico and in 2008 aboard the Los Angeles Dodgers' float. In 1981, Valenzuela participated in the East Los Angeles Christmas Parade as Grand Marshal. ^ a b c O'Connor, Kevin (2002). "Fernando Valenzuela | St. of Pop Culture | Find Articles at BNET". Findarticles.com. Archived from the original on July 17, 2012. Retrieved July 25, 2009. ^ "Fernando Valenzuela – BR Bullpen". Baseball-Reference.com. March 16, 2009. Retrieved July 25, 2009. ^ a b Gonzalez, Alden (February 3, 2013). "Valenzuela inducted into Caribbean Hall of Fame". MLB.com. Retrieved April 15, 2015. ^ Fernando Valenzuela Minor League Statistics & History. Baseball-Reference.com. Retrieved May 17, 2015. ^ Crowe, Jerry. A screwball chain of events led the Dodgers to Fernando Valenzuela. Los Angeles Times. March 27, 2011. Retrieved May 17, 2015. ^ 1980 Texas League pitching leaders. Baseball-Reference.com. Retrieved May 17, 2015. ^ a b Brown, Daniel (February 16, 2012). "Jeremy Lin: Fernando Valenzuela understands Lin-Sanity first hand". San Jose Mercury News. Archived from the original on February 18, 2012. ^ "SI.com - Writers - Alex Belth: The five true pitching phenoms - Tuesday August 8, 2006 11:33AM". Sportsillustrated.cnn.com. August 4, 2006. Retrieved July 25, 2009. ^ "Fernando Valenzuela interview". Open Your Eyes Magazine (in Spanish). December 20, 2008. Archived from the original on January 31, 2009. Retrieved December 21, 2008. ^ "Phillies lead Dodgers 5–4 after 6". Fox News. May 16, 2008. ^ "1986 Awards voting". Baseball-Reference.com. ^ Friend, Tom (July 17, 1986). "Hubbell: My record didn't mean much: Valenzuela's All-Star strikeout effort doesn't mean much, either, he believes". Los Angeles Times. Retrieved April 16, 2015. ^ "Fernando Valenzuela released by Dodgers". Lodi News-Sentinel. March 29, 1991. Retrieved April 15, 2015. ^ Bill Shaikin (January 22, 1999). "Valenzuela Has Dodger Invite". Los Angeles Times. ^ Stephen, Eric (January 30, 2015). "Jaime Jarrín & Jorge Jarrin new Dodgers Spanish radio team". truebluela.com. Retrieved January 30, 2015. ^ Sanchez, Jesse (October 26, 2005). "Latino Legends team announced". MLB.com. Retrieved April 16, 2015. ^ "Big Unit beats Dodgers 2–1 in Manny's LA debut". Yahoo.com. February 8, 2008. Retrieved August 2, 2008. ^ "'Fernando Nation' to air on ESPN '30 for 30' on October 26". ESPN. September 30, 2010. ^ "Watch: Vin Scully brings Dodgers legends for 1st pitch". SI.com. Retrieved October 26, 2017. ^ "Beloved Scully delights Dodgers fans at Game 2". ESPN.com. Retrieved October 26, 2017. ^ Castro, Tony (July 8, 1985). "Something screwy going on here". Sports Illustrated. Archived from the original on April 15, 2015. Retrieved April 15, 2015. ^ Broadcasters. MLB.com. Retrieved May 17, 2015. ^ "Fernando Valenzuela Minor League Statistics & History". Baseball-Reference.com. Retrieved April 16, 2015. Click, Paul (July 2001). "20 Years Ago, Fernando Valenzuela Was King of the Hill". Baseball Digest. Archived from the original on February 10, 2009. Retrieved February 15, 2007. Linden, Lance. "Fernandomania, Revisited". Archived from the original on March 8, 2007. O'Connor, Kevin (2002). "St. James Encyclopedia of Pop Culture: Fernando Valenzuela". St. James Encyclopedia of Pop Culture. Archived from the original on July 17, 2012. 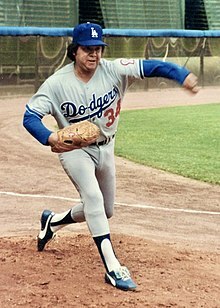 Wikimedia Commons has media related to Fernando Valenzuela.